(2) Torque and rotational statics. (2) Angular momentum and its conservation. Circular motion and rotation’ carries 4% of the total points for AP Physics B and 9% of the total points for AP Physics C.
ac = v2/R where ‘v’ is the speed of the object and R is the radius of the circle. The direction of ac is always towards the centre of the circle. Therefore, the centripetal acceleration is ac = ω2R. If T is the time period of revolution of the object in circular motion and f is its frequency, we have f = 1/T and ω= 2π/T = 2πf. ω = ω0 + αt where ω0 is the initial angular velocity and and α is the angular acceleration. [This is similar to the equation, v = v0 + at in linear motion]. [This is similar to the equation x = x0 + v0t + (½) at2 in linear motion]. (3) Torque (τ) is the moment of force and is the product of force and the lever arm. By lever arm we mean the perpendicular distance (ON in the figure) of the line of action of the force from the origin. Therefore, Torque τ produced by the force F acting on the particle at P = ON × F.
(4) A rigid body will be in mechanical equilibrium, if the total force and the total torque on the body are zero. 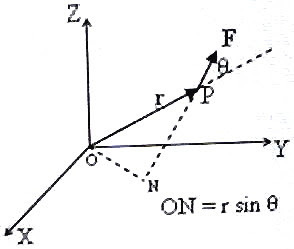 The condition of zero net force will ensure that there is no change in the linear momentum and the condition of zero net torque will ensure that there is no change in the angular momentum. L is a vector whose magnitude is rpsinθ where r is the distance of the particle from the origin, p is the magnitude of the linear momentum vector p and θ is the angle between the vectors r and p.
Angular momentum is the moment of the linear momentum and is the product of linear momentum and the lever arm r sinθ. [By lever arm we mean the perpendicular distance of the line of action of the linear momentum from the origin]. I = ∑mr2 where m is the mass of a particle at perpendicular distance r from the axis of rotation and the summation is for all the particles. Note that both I and k depend on the axis of rotation. Perprndicular axes theorem states that the moment of inertia of a lamina about an axis perpendicular to its plane is equal to the sum of its moments of inertia about two perpendicular axes concurrent with the perpendicular axis and lying in the plane of the body. A hollow cylinder (pipe) also has the above value for its moment of inertia about its own axis. L = Iω where I is the moment of inertial about the axis of rotation and ω is the angular velocity. This is similar to the expression for linear momentum p = mv. In angular motion (rotational motion) I is to be used in place of m and ω is to be used in place of v.
τ = I (dω/dt) = I α where α is the angular acceleration. I1 ω1 = I2 ω2 where I1 and I2 are the initial and final moments of inertia and ω1 and ω2 are the initial and final angular velocities of a system in the absence of external torques. a = gsinθ / [1 + (k2/R2)] where R is the radius of the body and k is the radius of gyration about the axis of rolling. Since Mk2 = (2/5)MR2 for a solid sphere, k2/R2 = 2/5. This is the least value in the case of regular bodies and hence the acceleration a is maximum in the case of a solid sphere. In contrast, in the case of a ring (and pipe), the value of k2/R2 is 1 and is the maximum in the case of regular bodies and hence the acceleration a is the minimum in the case of a ring. If differently shaped bodies are allowed to roll down from the top of an inclined plane, the solid sphere will reach the bottom first and the ring (and the pipe) will arrive last. It is interesting to note that for a given shape, the time of arrival at the bottom is independent of mas and size. a = (Mgsinθ) / [M + (I/R2)] where M is the mass of the body; but it will be better to remember the above form in terms of the radius of gyration, k.
This is similar to the expression for work, dW = Fds in linear motion. In the next post, we will discus typical questions in this section. Allright,I understood the formula of calculating the acceleration of a rolling body down the formula,is there any formula to calculate the velocity of a rolling body down the inclined plane. To obtain the linear velocity down the plane, just substitute the value of the acceleration in the equation of linear motion such as v = u + at or v^2 = u^2 + 2as. You can use the energy relation, mgh = (1/2) mv^2 +(1/2)Iω2 also to find the velocity. Here ‘h’ is the height of the inclined plane, ‘I’ is the moment of inertia and ‘ω’ is the angular velocity which is v/R where R is the radius of the rolling body. Don’t think of a ready made formula for ‘v’.